Steel frame screens are mostly applied to the shale shakers with wedge fastening equipment. The screen frames adopt high strength square steel tube welded to the perforated panel. They are sturdy and reliable. These screens are constructed with two or three stainless steel layers bonded to a steel support panel. Accessory rubber plugs may be used to repair the broken layers. Shaker screen is important part for shale shaker and cleaner. 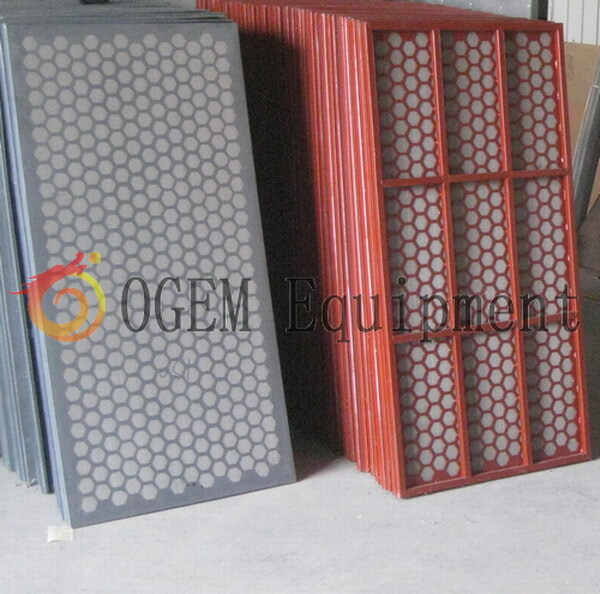 OGEM can provide qualified shaker screen for Derrick shaker, NOV Brandt shaker, other brand shale shaker. ?Configured with high strength steel frame, stiffeners and screen mesh with moderate tension, the performance of the steel frame shaker screen is enhanced largely in strength, service lifetime and flow of drilling fluid that the product can bear. ?High strength frame, moderate wire mesh tension , accurate Cut Point design increase the flow rates and handling capacity.
? The mesh numbers of the furnished screen meshes are different. Through combining the screen meshes correctly and appropriately, the screening effect can be improved greatly.
? The wedged rapid tensioning device allows for more convenient installation of the product. The time for stopping the machine to replace the product can be saved. ?Multi-layer wire mesh improve the screen life.
? The screen mesh is divided into a number of small independent meshes to avoid local damage and excessive expansion. Meanwhile, the special rubber is available for repairing damage, which can save time and reduce using cost.